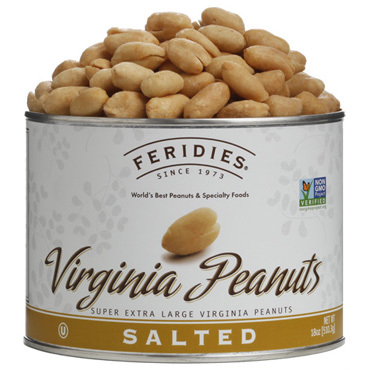 Send FERIDIES Virginia Peanuts monthly, bimonthly or quarterly and be remembered by clients, friends and family throughout the year. 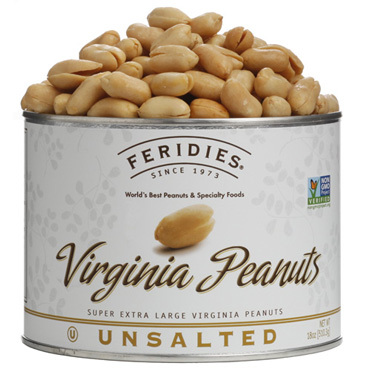 A can of FERIDIES' award-winning Virginia peanuts makes a great gift. However, for that special friend or client you may want to give something that continues giving all year. For such people, our Nut of the Month Club Plans are the perfect solution. Your friends will be delighted when they receive an 18 oz. or 40 oz. can of our luscious peanuts and special treats four, six or even 12 times a year. We have five different Snack Club Plans to suit any taste. The Salted Peanuts Club Plan offers our super extra-large Virginia peanuts hand roasted in pure peanut oil and lightly salted to maintain the peanuts distinctive flavor and crunchiness. For those watching their sodium intake, you can select the Unsalted Peanuts Club Plan. 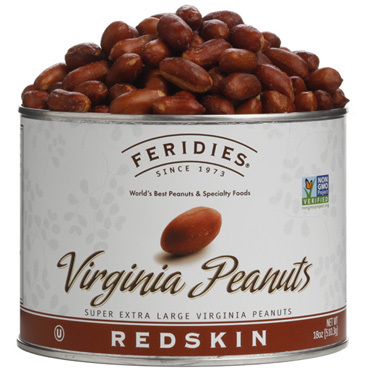 Our Redskin Peanuts Club Plan has the same wonderful Virginia type peanuts but roasted gently with their skins in pure peanut oil and then lightly salted for a unique flavor all their own. 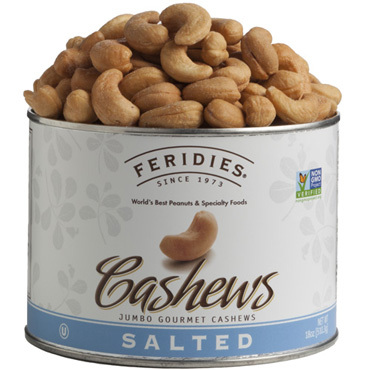 Or, for something with a little zing, we have our Cajun Peanuts Club Plan with our great peanuts perfectly seasoned with FERIDIES' secret blend of Cajun spices. Finally, for those who like change, we have our Variety Club Plan that delivers over 12 months one of the flavors above or Butter Toffee, Honey Roasted, and Chocolate Covered Virginia Peanuts, Salted Cashews and FERIDIES' 5 O'clock Crunch or Peanut Brittle Crunch. Virginia-type peanuts are known as "the peanut of the gourmet" because of their large size and crunchy texture. They are grown in southeastern Virginia and northeastern North Carolina. 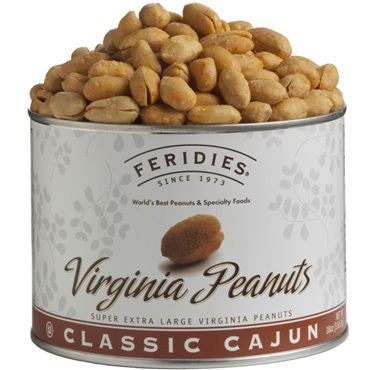 Each year, we at FERIDIES select the largest 2% of the crop and gently hand roast them in small batches in pure peanut oil to keep them cholesterol free, preserve their natural peanut taste and maintain their healthy qualities. Our Month Gift Club Plan prices reflect a 10% savings from single-can prices. Standard Shipping is included for deliveries in the U.S.
FERIDIES' Monthly Gift Clubs – gifts that give and delight all year.